Yoga on the Lawn - The Junior League of Boston, Inc.
Start your morning off with “Yoga on the Lawn” at the 2017 Designer Show House! Saturday, October 21 – Register Today! Saturday, October 28 – Register Today! Both yoga classes are free and open to all. You must register to participate. 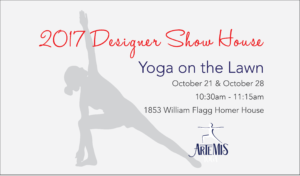 Join Artemis Yoga and the Junior League of Boston for a vinyasa flow class on the lawn of the 2017 Designer Show House. Participants can bring a yoga mat or towel if they wish. After yoga, we invite you to tour the 2017 Designer Show House to see how over 20 local designers have transformed this historic home (ticket required)! This class does not include a ticket to tour the 2017 Designer Show House.